1. Relating to not having foresight about what can or will happen; incautious, unwary about future needs: Mark's improvident spending splurges and abnormal lack of concern about his retirement resulted in his not having enough money to live on and ending up as a homeless beggar. 2. 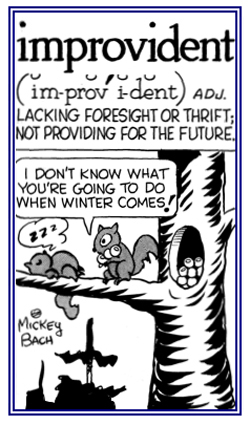 Etymology: from Latin improvidus, "not foreseeing". © ALL rights are reserved. A reference to someone not foreseeing and providing for the future. 1. A creation spoken or written or composed extemporaneously (without prior preparation). 2. An artifact that has been brought into existence by someone; especially a musical passage or a dramatic skit. Someone who improvises or makes, invents, or arranges offhand to fabricate out of what is conveniently on hand. 1. To invent, to compose, or to perform extemporaneously; that is, with little or no preparation: The conductor of the jazz band had improvised some special musical renditions which the audience found very melodious and pleasant to hear. 2. To make or to provide something from available materials: Martin's wife had to improvise dinner from what she found in the refrigerator when her aunt and uncle came to visit without any warning. © ALL rights are reserved. 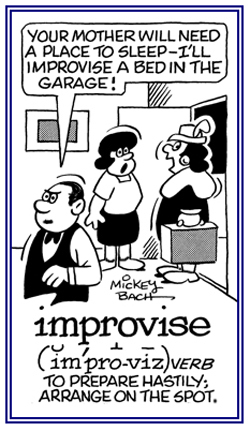 Characterized by, made, or said without previous preparation: "She prepared an improvised skit." Someone who speaks or performs without preparation: "He became an improviser when he started his opening speech because he forgot his notes." 1. A situation or act in which there is a lack of common sense or wisdom. 2. Etymology: from Latin imprudens, "not foreseeing, lack of fore sight"; from Latin in-, "not", and prudens, prudentis, "foreseeing". 1. Relating to showing carelessness, with no forethought, or without good judgment: In a moment of imprudent carelessness, Tommi decided to go for a long walk without first checking the weather report which was predicting freezing rain. 2. 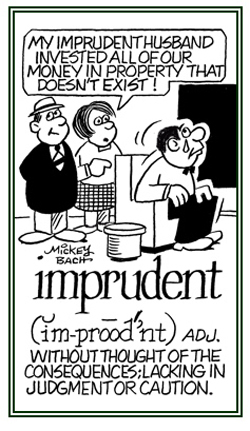 A reference to being unwise or indiscreet, and foolish: Rebecca's sister made some imprudent investments which she regretted later because they significantly decreased in value. 3. Descriptive of being incautious, unwise, indiscreet, and foolishly impulsive: It was imprudent of the doctor not to discuss Joe's medical problems with him. © ALL rights are reserved. 1. 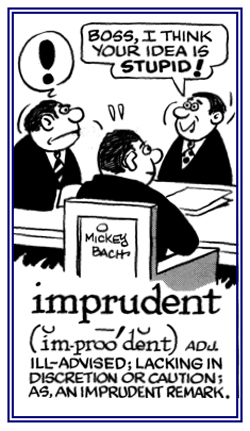 Relating to being without caution; discretion: "Jane spoke to her manager in an imprudently disrespectful manner." 2. A reference to being unwise or lacking good judgment and objectivity: "It was imprudently dangerous for Mark's friend to drive with those worn-out tires on his car." Translation: "In Thy light we shall see the light." Also translated as, "In Thy light shall we see light." Motto of Columbia University, New York City, USA; the College of Great Falls; Great Falls, Montana; and Ohio Wesleyan University in Delaware, Ohio. The sight perceived by the peripheral retina (the outer boundary or edge of the light-sensitive membrane lining the inner eyeball and connected by the optic nerve to the brain).